An Amsterdam travel guide – art and architecture in The Netherlands’ canalside cycle-crazy capital. There are so many ways to see the sights on an Amsterdam city break. 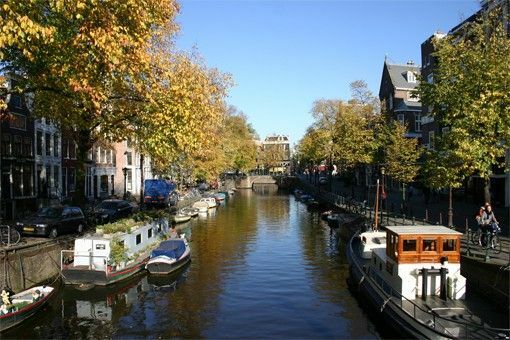 Walk cobbled streets flanked by elegant townhouses, join bike-mad Amsterdammers on the leafy paths of Vondelpark or cruise the canals from your Amsterdam hotel. If you’re not sure where to stay in Amsterdam, use this guide to the city’s neighbourhoods to help you choose the right Amsterdam hotel for your city break. Enjoy 17th-century Dutch masters including Johannes Vermeer, Frans Hals and Rembrandt at the Netherlands’ largest arts, craft and history museum. Book a Rijksmuseum hotel in Amsterdam and take a relaxing break surrounded by art and beauty. Join thousands of orange-dressed revellers on the streets of Amsterdam for King’s Day - a nationwide celebration to mark the birthday of Holland’s Queen Beatrix. King’s Day hotels in Amsterdam go quickly, so plan ahead. Whatever you think you know about Amsterdam, there is a lot more to be discovered. There are certain sights which you may plan on seeing, such as the famous Red-Light District or Anne Frank’s house, but beyond that you’ll find over 40 museums, The UNESCO Canal Ring and an extreme 1,281 bridges. The diversity in nationalities found in Holland brings an eclectic mix of culture into the capital, making it a fanciful place to discover. Holidays in the Netherlands are always surprising. This north-western European nation packs it in with diverse cities, world-class art and picturesque towns. Its windmill-dotted landscapes are cycle friendly, while windswept coastlines and colourful flowers make the great outdoors a real treat. Book your Netherlands hotel to see the country for yourself. This forward-thinking student city combines youthful exuberance with a thought-provoking history. It’s a city with a distinctive, resilient pan-European character. Book a Maastricht hotel to discover lively restaurants, cafés and bars calmed by the tranquil River Meuse. Whether you’re looking to take in a refined classical concert or fancy hitting the dance floor to some heart-rate inducing European trance, Amsterdam’s nightlife is bursting at the seams. On top of all this, there's an array of cabaret and comedy nights, outdoor summertime concerts, and theatre shows. Amsterdam may have a reputation for grown-up hedonism, but families certainly won't feel out of place in the capital. You can join Amsterdam parents nipping along streets on their bikes, little ones plonked merrily in their backseat, or head to flower-filled parks and child-friendly museums where budding minds will be inspired. The home of Rembrandt, Amsterdam is renowned for its artistic legacy, and you can discover the city’s cultural roots in a grand array of museums and galleries. In fact, just strolling the streets is like exploring an open air exhibition, with centuries-old houses, ornate old churches, and patches of green parkland all around. Amsterdam offers a range of hostels, apartments and five-star hotels to cater to the diversity of age ranges and budgets of people who visit the city. From romantic city breaks to student weekends away, Amsterdam provides excitement for everyone with a place to sleep at the end of the day. Whether you’re looking to stay amidst the buzz of the city center, or further out for a quiet night, there are enough options to suit any budget. Amsterdam has a fantastic array of shopping malls, markets and independent shops that will keep you busy for hours, selling everything from antiques to Gucci, souvenirs to hemp; you won’t know where to start. With shopping streets such as the Negen Straatjes or the Kalvertoren Mall, you can chose from fashion brands or second hand items with plenty of opportunities to stop and catch your breath in one of the quality cafes. Amsterdam’s cultural diversity shines through in the vast amount of restaurants that serve cuisines from Thai to tapas, local Dutch to Arabian. Whether you’re looking for an award-winning menu or a local café, there’s no end to what you will find in the city as it offers something for a huge variety of tastes. Just remember, coffee shops in Amsterdam will offer something a little different than the ones back home so be careful what you order! Amsterdam is continuously changing and new attractions are emerging all of the time, which means you’ll never be stuck for things to do in the city. In a weekend you will be able to take guided tours, visit beautiful churches and even try glow in the dark mini golf. Pick up an I Amsterdam City Card and you’ll save money on transport and some of the best attractions. Pancakes in cosy bakeries, seafood stalls and “brown” cafés – you’re spoilt for choice with food and drink things to do in Amsterdam. Book an Amsterdam hotel and explore the city’s gastronomic offerings. Spring holidays in Amsterdam are all about alfresco dining, national holidays and flower-filled parks. Easter sweets adorn elaborate patisserie window displays. Book an Amsterdam spring hotel for a city break to remember. Converted canal houses, boutique hideaways and luxury suites with park views – choose your hotel with this guide to the top 10 hotels in Amsterdam. Though it is better known for its treaty than its eateries, Maastricht is chock-a-block with tempting culinary hotspots. Book a Maastricht hotel to treat your taste buds to savour marinated rabbit, baked goat’s cheese, robust meat stews and sweet fruit flans. Open-air music, canalside cocktails and lazing in the park, are all part of a summer holiday in Amsterdam. Book a summer hotel in Amsterdam to enjoy the city alfresco. A short break in Amsterdam might not seem enough, but our diverse 48-hour itinerary will help you make the most of your stay in an Amsterdam hotel. To outsiders Amsterdam may be synonymous with its Red Light District and liberal hedonism, but this upbeat city’s not just for party animals. Brimming with world-class museums, thrifty flea markets, and flower-filled parks, as well as some seriously cool bars, pubs, and cafés, Amsterdam’s a place to have fun, no matter what your age.